Ice is one of the most troubling and dangerous aspects of cold weather — especially when icy conditions impact the roads you’re driving on! Snow, icy weather, and other forms of cold precipitation cause many traffic accidents. Some 1.2 million road accidents are caused by hazardous weather each year, killing more than 6,000 people and injuring 445,000 others. Icy roads aren’t just a winter hazard though. Ice is also common in the late fall and early spring throughout much of the country, and it can form any time of the year in some regions under the right conditions. Hail — another dangerous form of ice — often occurs in the summer and presents its own level of danger. Of course, many towns and cities use salt, brine (or sometimes sand) to help eliminate some of the dangers of driving on icy roads. But it’s impossible to apply salt, sand, or brine to all roads at a single time in an entire community. So, the earliest hours of a winter storm or icy conditions are often the worst. If you haven’t experienced snowy roads before, you’ve probably seen photos that look just as treacherous as the real thing — inches, even feet, of snow covering roadways, blocking driveways, and creating a wintry mess. 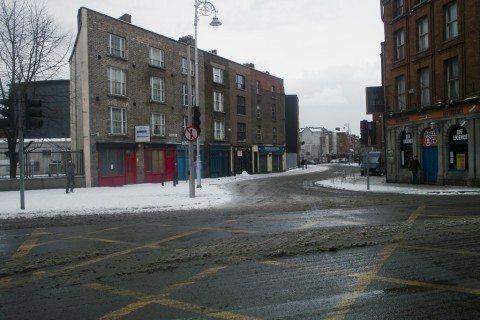 Snow itself is a driving hazard because it can block roadways and cause cars to get stuck. Drifting snow is another major problem that can block roadways. 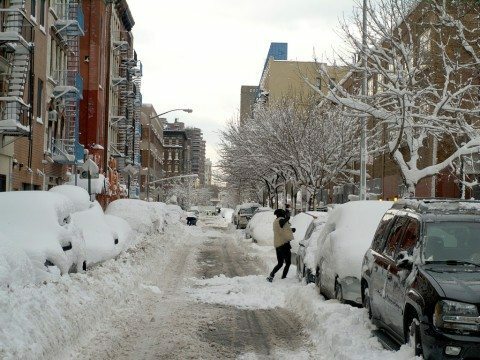 Snow drifts can measure several feet thick and are usually caused by strong winds during blizzards and other winter storms. 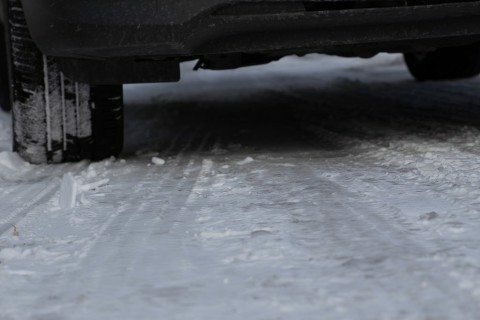 Another road hazard is snow that melts under the heat of tire pressure and then refreezes as a sheet of ice. Keep plenty of distance between you and the vehicle in front of you — ideally, 2 or 3 full car-lengths. Accelerate slowly — this improves your traction on the road when you’ve got snow underneath your tires. Don’t slam on the brakes — that would remove the traction between your tires and the road, giving you no way to control your vehicle. Don’t stop unless you absolutely have to — instead try to slow down enough to keep your car rolling until the light changes, or the car in front of you moves. When driving up hills in snow, don’t accelerate any more than you have to and don’t stop on the hill if possible — you need the car’s steady inertia to power you safely up a snowy hill. Remember, a 4-wheel drive vehicle does not make you invincible when driving in snow. Sleet and freezing rain are other serious winter road hazards. Here are some stats. Sleet — Frozen precipitation that falls through a thin layer of warm air and then refreezes into sleet before it hits the ground. Freezing rain — Frozen precipitation that melts when it falls through a layer of warm air and then freezes on a cold surface, causing a layer of ice. Sleet and freezing rain tend to form near boundaries where cold air masses meet warmer air masses. Many Doppler weather maps indicate sleet and freezing rain with light blue or pink colors. Freezing rain and sleet are particularly dangerous on bridges, overpasses, and other stretches of roadways where cold air can surround the roadbed, causing those portions of the road to freeze more rapidly. First and foremost: don’t drive in freezing rain if you don’t have to! There isn’t any tire (not even a snow tire) that is going to prevent your vehicle from slipping and sliding. If you absolutely must drive in freezing rain, make sure that your vehicle is stocked with the necessary safety gear first. Watch for broken tree limbs and power lines that have collapsed under the weight of the frozen precipitation. Just a quarter of an inch of ice can add 500 pounds of weight on trees which can easily bring them down. Road ice can be very difficult to see — especially when it forms as black ice, one of the scariest winter road hazards. The ice itself isn’t actually black. Rather, it’s a thin coating of transparent ice that allows the black (or darker) roadway surface to show through the icy layer. Black ice may appear as a dark patch on the roadway. You might catch some glare from street lights or traffic signal shining on the black ice. You’re better safe than sorry when it comes to driving on roads that may have black ice. If you suspect there may be ice on the roads, exercise caution and drive slowly and methodically until the sun has time to melt all of the icy spots on roadways. Use extreme caution on bridges and overpasses — they typically freeze first and melt last. If you can tell that you’ve just driven over black ice, don’t overreact. Stay calm and simply allow the vehicle to completely pass over the icy patch. Do not hit the brakes to slow down and do not turn the wheel to change lanes until you’re confident that you’re no longer on a patch of black ice. The first thing you should if you sense that you’re driving on black ice is to de-cellerate by taking your foot off the gas pedal. If possible, head for an area of the road that would provide more traction — such as a snow-covered spot or a gravel-covered driveway or pull-off. Hail is a type of frozen precipitation that can form during anytime of the year, including during the late spring and summer — when severe weather forms throughout many parts of the nation on a virtually daily basis. 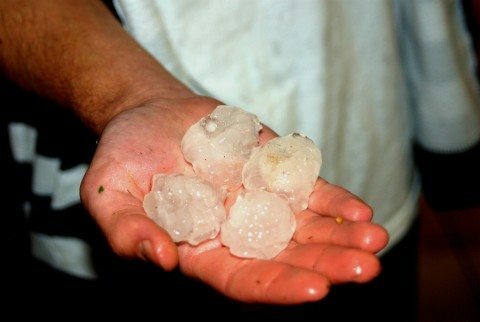 Hail can range in diameter from the size of a pea to larger than a baseball. Regardless of its size, hail can be incredibly dangerous. One of the worst things is to get caught driving through a hail storm. 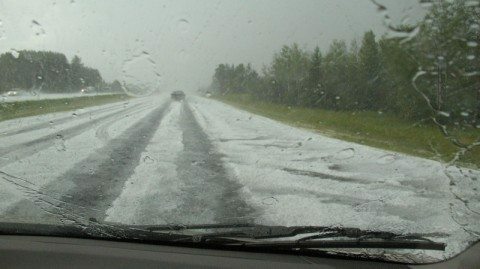 Not only is hail a dangerous road hazard because it covers the road with icy pellets (hail often melts within seconds of reaching the ground in warmer weather), but also because large hail pellets can actually smash car windshields, causing severe injuries and even death. In fact, according to the National Oceanic and Atmospheric Administration, 24 people die from hail each year. If the hail is falling rapidly, then you won’t have a clear view of the road and other vehicles on the road. Slow down! At the same time, turn on your headlights, and keep 3 car lengths between you and the vehicle in front of you. If you start to slide on a hail-covered road, slowly take your foot off the gas pedal. Do not hit the brakes or make any sudden steering adjustments. Pull over as soon as you see a safe location — If it’s really bad and you need a place right away, then choose an overpass or the shoulder of the road (as long as it is paved). If you’re in a populated area, then choose a gas station with an overhang or a parking lot — so you’re off the road entirely. Stay inside the vehicle — you don’t want to get pelted by hail stones falling at rapid speeds. It’s bad enough having to worry about snow, sleet, freezing rain, black ice, hail, and other forms of road ice that can cause accidents and dangerous driving conditions. But, what about manmade ice? Sprinklers are one of the most common forms of manmade road ice. Misguided sprinkler heads can cover roadways with water that can form into thin patches of ice. Other causes of manmade ice include splashing water from waterfalls, water fountains, running hoses, leaky fire hydrants, and the like. You should treat driving on manmade road ice just like driving on black ice (see tips above). The best way to stay safe when the roads are covered in ice is to simply stay home. Don’t drive on icy roads when you’re tired. If you’re driving a long distance, let others know where you’re going. Don’t drive in remote areas at night or when winter weather is particularly rough. Make sure that your gas tank is more than half full to help prevent the fuel from freezing. Don’t use cruise control when driving on ice or snow. Steer the direction in which you want to drive. Accelerate and brake slowly and methodically to avoid skidding. Maintain a driving distance of at least 10 seconds between your vehicle and the car in front of you. Avoid coming to a complete stop as much you can — especially when driving up a hill. 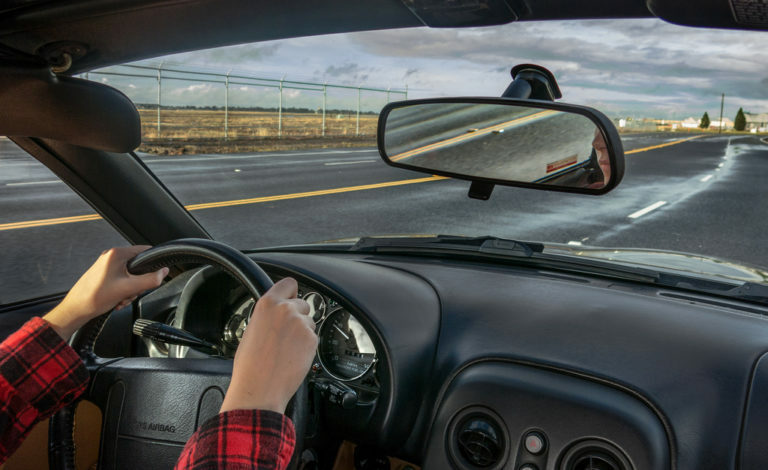 Once you get over the crest of a hill, drive down the slope as slowly as you can without applying too much pressure on your brakes — then steer in the direction you want to drive. If you get stuck in the snow, stay in your car — it will provide safe shelter and allow rescuers to find you more easily. If you’re trapped in your car, tie a brightly colored cloth to the antenna or atop a rolled-up driver’s side window of your car so you can be spotted more quickly. Keep blankets, coats, and jackets in your car to help you stay warm if you’re trapped in your vehicle during cold weather. 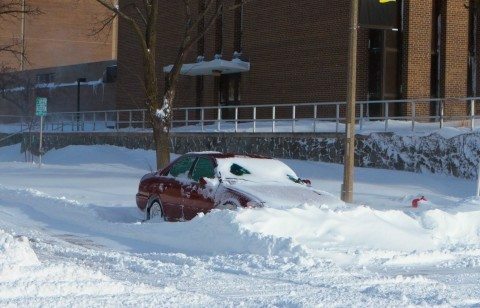 Make sure the exhaust pipe on your car isn’t clogged with snow. If it is, clear the area so harmful carbon monoxide fumes don’t get into your vehicle. Rock Salt vs. Salt Brine: What’s Best For Road Safety?